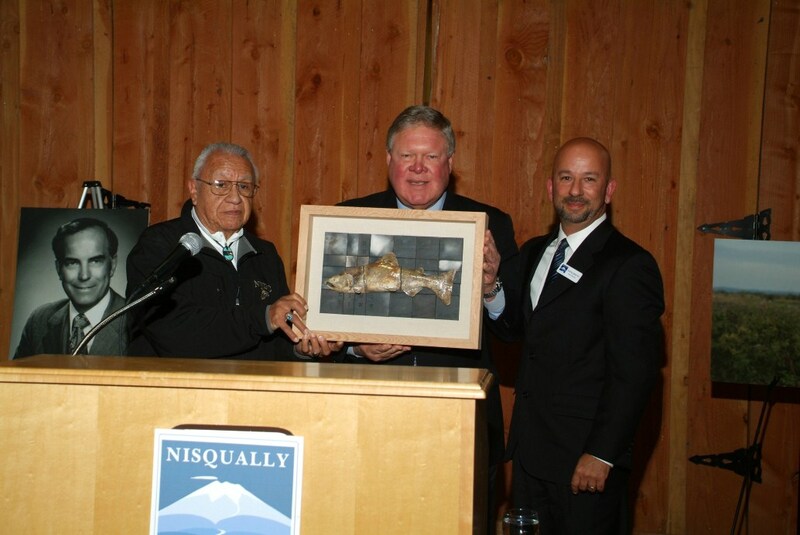 The Daniel J. Evans Nisqually Stewardship Award is given once every five years to an individual who has demonstrated extraordinary leadership in helping preserve the Nisqually Watershed and delta. 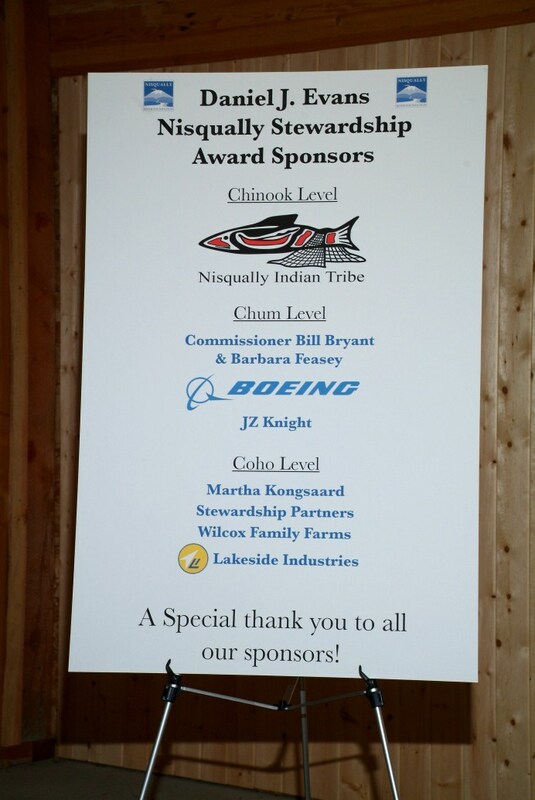 Five years ago, Governor Evans presented the first award to Billy Frank Jr.
On October 24th at the Nisqually Indian Tribe’s Braget Farm Conference Center, Billy Frank, Jr. presented this award to the Honorable Norm Dicks for his tireless work towards protecting salmon, wildlife, and habitats in the Nisqually watershed and throughout Puget Sound. Congressman Dicks’ has obtained funds for the expansion of the Nisqually National Wildlife Refuge and helped direct funds to the refuge for the biggest estuary restoration on the West Coast. He assisted in settling a long standing dispute between the Nisqually Indian Tribe and Fort Lewis and then directed funds to build a critical fish hatchery as a part of that settlement. His leadership with Pacific Coastal Salmon Recovery funding has been critical in helping protect over 75% of the river’s mainstem riparian habitat. Most recently, Congressman Dicks was instrumental in getting funds to implement an innovative approach to salmon recovery with the creation of a weir to support the continued recovery of wild salmon in the Nisqually. Rep. Dicks is the second recipient of this award.